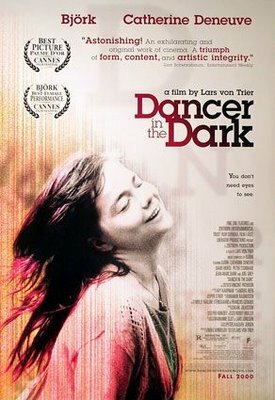 Dancer in the Dark, starring BJORK and CATHERINE DENUEVE seemed to promise to be a WONDERFUL experience! A MUSICAL???!!! Starring BJORK!!?? There has never been another movie that I know of that matches the horror and devastation created by the unfolding of this movie. Let me just try to capture the experience here: Along with our wishes and dreams, everyone shares the same layer of thin ice upon which we walk, hoping desperately to fulfill at least a few of those dreams before falling through, if any are fulfilled at all. This movie lets you fall through; it knocks you down through the ice, mercilessly. It doesn’t just let you fall through; it removes the color from all of the effort you’ve ever made in your life before that moment. It flattens every wish, dream and moves us into a place of dangerous pointlessness inside that we know is there, but cannot ever EVER touch. And this movie not only makes you touch that space, it smothers you in it, drowning you below the icy surface through which you just fell, and as you sink, you can still see people above, walking, ever so gently, but desperately blind, and you know they will join you soon enough. So… I saw that movie. And, actually, I LOVED it. A genius, dark, dangerous exploration that is absolutely cruel in its contrast between the inner, beautiful dance numbers and musicals through which Selma/Bjork interprets her mundane life, and the terrifying momentum that is locked into motion upon this symbol of purity and innocence… To me, for a movie to take you that far into such taboo territory and unapologetically leave you there, is an art that may not be pleasant, but it is art, nonetheless. And to somehow survive this movie means something… SOMETHING. Besides various personal experiences in my own life, watching this movie was one of the most painful things I have ever endured and recovered from. I saw this movie… ONCE. In the theater. Years ago. And I remember everyone around me was broken, devastated, and some could barely walk. I couldn’t speak clearly for hours. I couldn’t stop thinking about it for months, years. I never thought I could watch it again in my life, even though I really really wanted to try so I could rise above the experience and see the movie differently, objectively. So… I just tried to watch it again. Tonight. Alone. A HUGE, lovely mistake. I can barely see to type. My face is swollen with that horrible grimace from crying so hard. Amazing. The effect from this movie is just… amazing. I’m in awe. I highly recommend this movie to everyone. LOL! But please, not if you are unstable or alone, for god’s sake. Have you seen it? How many times? Oh my god… the scene where she sings “These Are A Few Of My Favorite Things” in the silence… utterly devastating. DEVASTATING! – the missing end of Selma’s song, just before… well, you know. I can’t wait until I am brave enough to watch this AGAIN! LOL! Ah well, at least we both like Woody Allen. Troy baby, this makes me want to rent the movie, with a little bit of fear…. I’ve heard of this movie but never knew what it was all about. Thanks for giving me an idea for a rainy weekend thing to do. Oh boy… the scene with “My Favorite Things”. The last time i saw it, that’s where my spirit cracked. Because everything in the movie before that was Selma not letting things get to her, trying to cope with it. But when she sings that song, it’s not to cover up something bad happening. It’s just her, alone, singing that song. It’s real. I’ve seen the movie two times now i think… it’s something you’re drawn to, eventhough it hurts, but in the end i think is uplifting. Because it’s the strongest argument i’ve ever seen against death penalty, and because it celebrates life. Perhaps a weird conclusion… but it feels like that. Jane, did you ever see it over the weekend? Roy, I’m so glad to hear someone chime in support of this movie! THANKS! I knew someone must understand. I’ve only seen it once, Troy, but it left an indelible mark on me. What a brilliant, horrible, beautiful film. I might try it again, when I no longer feel I am treading that same thin ice, drawn down the same sort of slippery slope of just one thing after another after another…. If I end up on death row I’ll know with no small amount of irony that I slid too far off that precipiece. Cool, a fellow bjork fan in the midst! Found you thru irene’s blog, YES the movie is Awesome I have seen it once in the theaters and at home since I brought it…maybe I should look at it again since October was the month it came out back in 2000(can’t believe it’s been SIX years! )…what’s cool about this movie is she swears NEVER to act again…wouldn’t be cool if this was the only movie she ever starred in? Hey, it’s me again, I remembered you from way back! Guess What?!? Bjork’s coming back to New York City! The first week of May! I just had to tell a fellow bjork fan, I Just brought my ticket for the Radio City concert on presale…she’s even coming to Northern Manhattan, Harlem and Washington Heights! AWESOME!